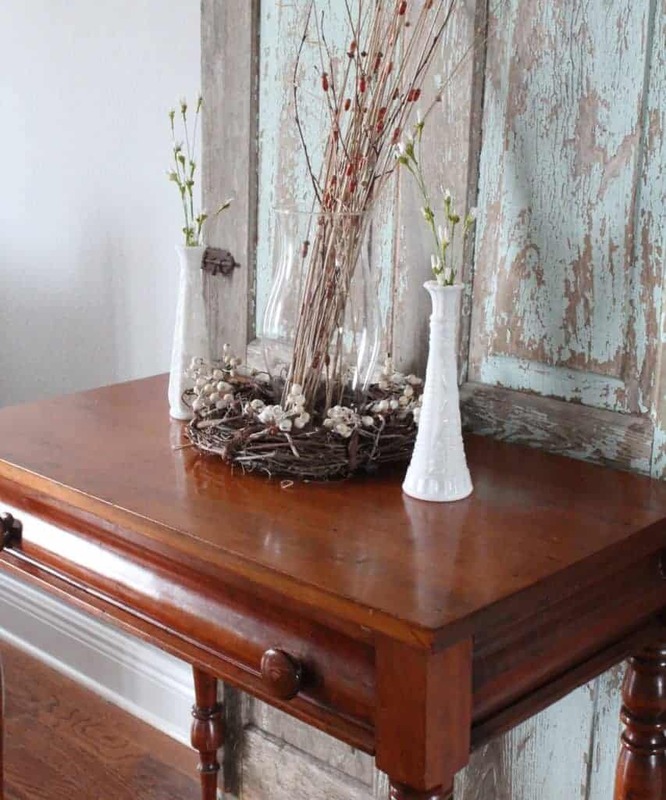 Do you own a solid piece of wood furniture that used to look great but now it’s a little dinged up and worn? Maybe this old piece of furniture has been handed down through a few generations and might not be in the best condition anymore. Do me a favor, don’t EVER get rid of it because chances are it can be refinished with only two household ingredients. 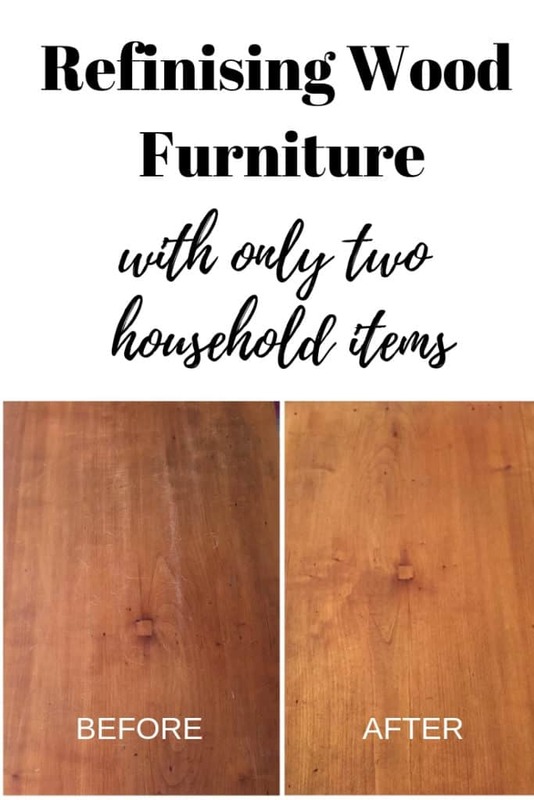 I see so many great pieces of solid wood furniture at thrift stores and yard sales because someone just didn’t want to take the time to refinish it. Guess what? I found a super easy and cheap (probably free if you have the items on hand) hack to restore and rejuvenate wood. 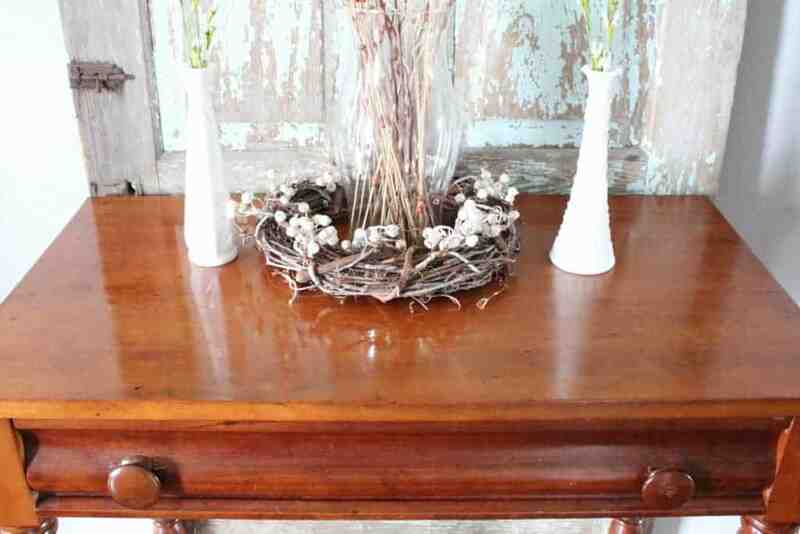 You will never guess the two household items that I used to refinish wood furniture to make it look new again. A friend of mine was moving and getting rid of a really nice solid wood desk, so I jumped on the opportunity to grab it. I loved the style of this antique piece of furniture. The wood was in great condition, well, all but the top piece of the desk. It had obviously been used to write on. 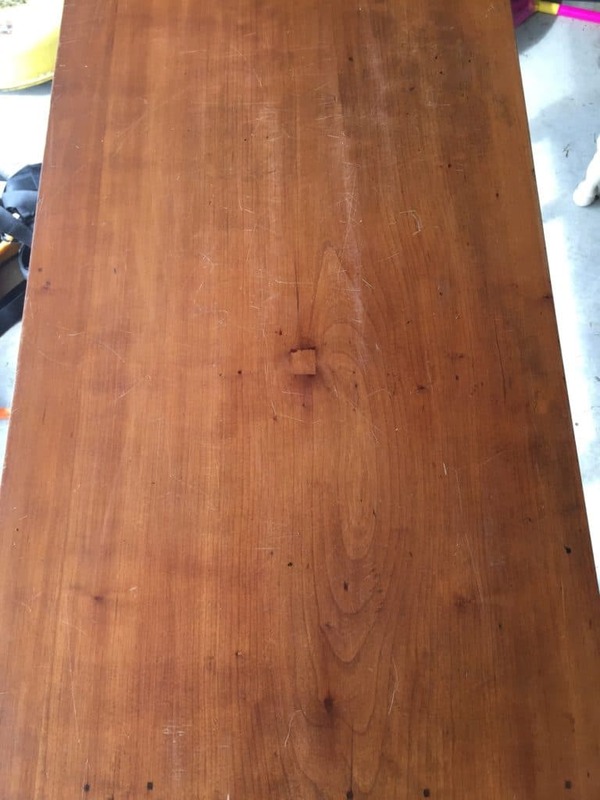 It was all scratched up and the top piece of wood was a different color than the rest of the desk. This is when I decided to refinish the desk with a trick I saw on Pinterest using just a few household ingredients. You can see above the scratch marks and discoloration from years of wear and tear. Although this desk was not in terrible condition, I still wanted to refinish the wood. 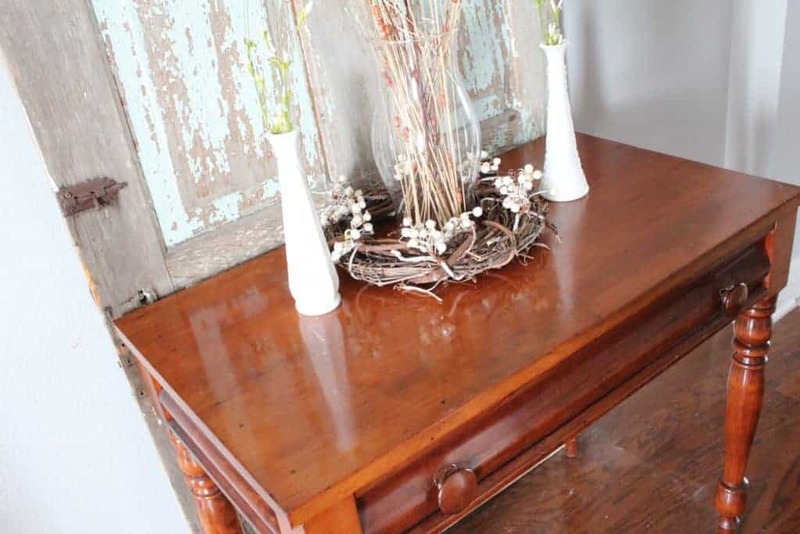 Since I already knew this was a solid piece of antique wood furniture, I wanted to find an easy way to “polish” or remove the scratches without having to sand and re stain the wood. My first thought was, “Duh, I just needed to buy polish.” The problem with polish is that it looks great for the first hour or so after you’ve cleaned it. Once the polish has dried, the cracks come back and it looks just like it did before it was polished. Anyone else feel this way? 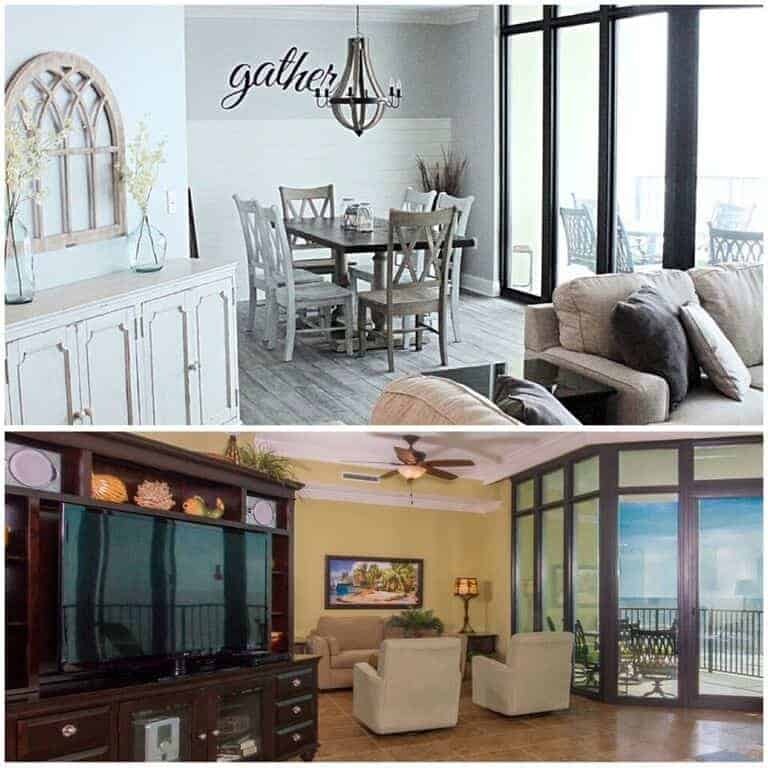 I needed a product that would really absorb deep into the furniture piece and remove the scratches and make it look new and refinished. The older I get the more i’ve learned to look around the house and use natural household items for cleaning rather than harsh abrasive (and expensive) products. Let me tell you, some of the best cleaning tricks are from simple products like Vinegar. Speaking of Vinegar, this is one of the two items I found that works wonders for removing and refinishing wood furniture. When my mom told me about this little furniture refinishing “hack,” I thought it would be just like using regular furniture polish. What I mean is, I thought it might work for an hour or so and then the scratches and dings would re appear. Guess what, I was delightfully wrong. Note: I only needed less than 1/4 of this mixture for the top of this desk. If you are not doing a full furniture piece I would suggest to mix up 1 part vinegar to 1 part olive oil with enough product you think you will need. 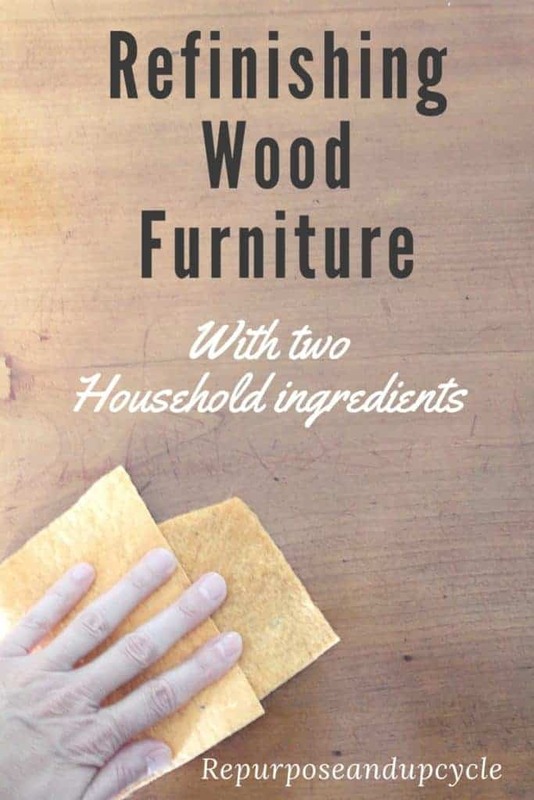 Mix these two ingredients and use a soft cloth to dip and rub all over the wood furniture. You should be able to see the scratches magically disappear! 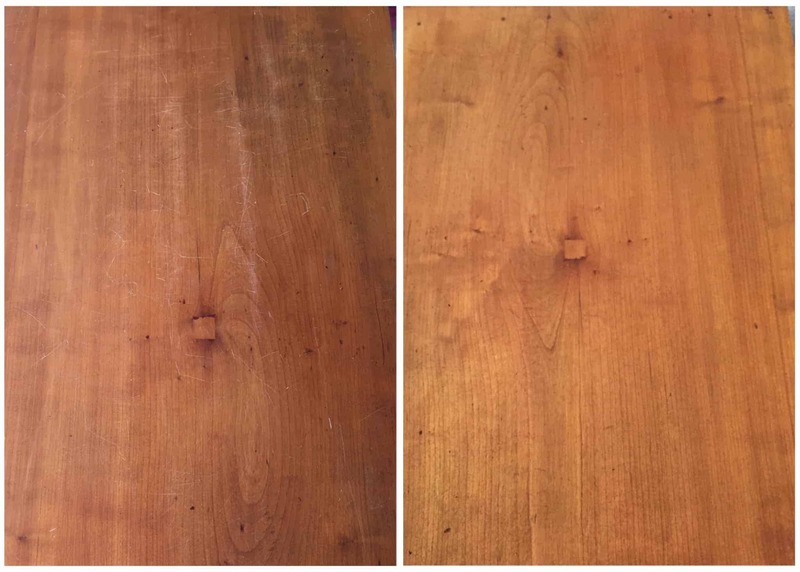 How does the Olive oil and vinegar work to really clean and restore the wood? Vinegar is acidic and works to cut through the dirt and grime and clean the wood very well while the olive oil really seeps into the wood and covers the scratches and small abrasions. The oil also puts moisture back into the wood to help restore the color. After I rubbed the vinegar/oil solution over the piece of furniture, I let it sit about 10 minutes. After about 10 minutes I took a dry cloth and wiped the excess moisture away. I honestly expected to see the scratches reappear, but magically about 90% of them are gone! Below is an UNEDITED picture of the before (left) and after (right). Best part about this wipe-on finish furniture hack; it restored the top of the desk to the same color as the rest of this piece. It’s funny how a few household items can work as well, or better, than a cleaning or refinishing furniture product you could buy at the store. So get out the vinegar and olive oil and start bringing those old antique beauties back to life! If you enjoyed this post I would love for you to pin it HERE or pin the image below. This is truly amazing. Brilliant ide! Great job Lindsey. I’ve been using it for years. It is all natural and good for your wood. 2 1/2 cups of olive oil? 2 1/2 Tablespoons of olive oil? Please clarify the amount of olive oil. I’m sorry for the confusion. I edited my post to read 1 part vinegar to 1 part olive oil. I mixed up 1/2 cup vinegar to 1/2 cup olive oil, and I only ended up using about 1/4 of it. Let me know if you have any more questions. How often do you have to do this to keep the wood looking good? Thanks for a great idea! How often do you have to repeat this? Every piece of furniture is different. Wish I had a concrete answer for that, but I don’t. I would give it a try and see how long it lasts. I’ve heard from other people who have done this and they said their scratches were gone for months! What a marvelous piece of furniture. I’m so glad you were able to restore it. I’m going to use that tip too. As a little girl, I lived in a small town in Kentucky where a shop handmade cherry furniture in the colonial style. That piece looks like the dining room furniture and bedroom furniture that my mom had. Those pieces are now in the hands of granddaughters. Absolutely amazing! Thank you for sharing with us this week at Celebrate Your Story and we hope you will join us again next week. Lindsey, this is amazing! (And I don’t use that word lightly.) I can’t wait to try it myself. That is an amazing transformation. I like the idea that it is a natural product. Okay, I’m going to give this a try! Thank you so much for posting this–I’d never have thought of using vinegar and olive oil together! And thanks for joining the Grace at Home party at Imparting Grace. I’m featuring you this week! Oh thank you! This has been a nifty little trick and I’m going to try it on my hardwood floors soon. I have an old sewing machine in a cabinet sitting in my garage. The top of the cabinet is in pretty bad shape, I am on my way to give this a try!!! Thanks for the info. Great little trick. I’m going to try it on my oak kitchen table. Thanks for sharing at Snickerdoodle. Thank You for a detailed guide. Will keep this handy for better future use.